The video released on Monday shows the destroyed facade of the Roman theater and a tetrapylon which dates back to 270 AD. The video compares the state of the architectural landmark from June 6, 2016, when all four columns and the facade of the theater were intact, to their present state from February 5. The Russian Ministry of Defense (MoD) said the terrorists blew up the proscenium – the central part of the ancient theater. 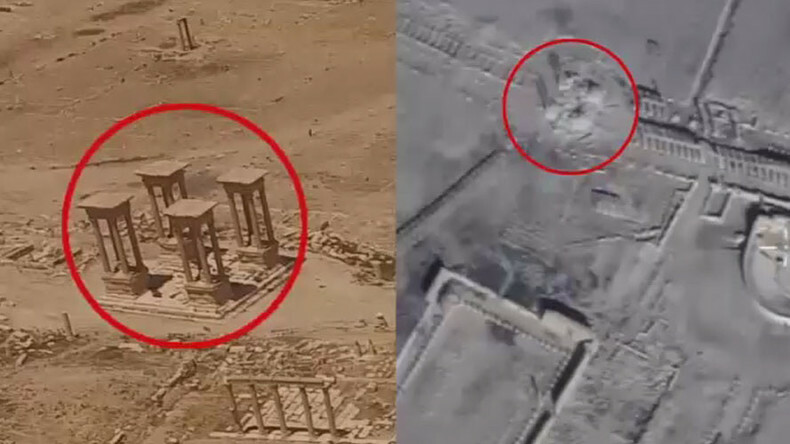 The Russian Defense Ministry said the latest activity by IS near Palmyra indicates that they intend to finish off the remains of the ancient city’s architecture, reducing it to rubble before they retreat. “We have detected an upsurge in truck movement near the ancient city amid Syrian troops’ successful advance on Palmyra. This indicates that IS wants to bring in explosives to deal maximum damage to the remaining architectural relics before they leave,” the Russian Defense Ministry said in a statement on Monday. Russian presidential spokesman Dmitry Peskov on Monday expressed hope that Palmyra, along with its invaluable monuments, will be freed from terrorists soon. “Unfortunately, these barbarian terrorists continue to cause destruction of the relics of human civilization. It is regrettable. And we hope that sooner or later these historical sites will finally be freed from these – one can hardly call them human – these barbarians,” Peskov said in a conference call with reporters. However, Peskov refused to comment on “matters of tactics and strategy” of the Russian troops with the media. 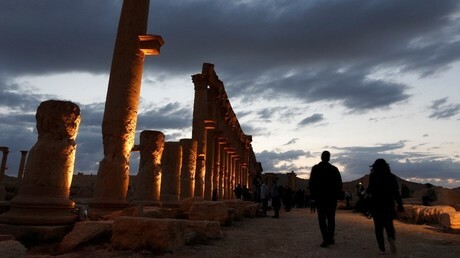 The ancient city of Palmyra, a UNESCO World Heritage Site, was one of the most important centers of the Roman Empire. After the site was recaptured by Syrian government forces last year, reconstruction work began to repair the extensive damage done by IS. In particular, experts were working on a remarkable Lion of Allat statue from the first century AD, as well as the Arch of Triumph, the Temple of Baalshamin, and the iconic 2,000-year-old Bel Temple. 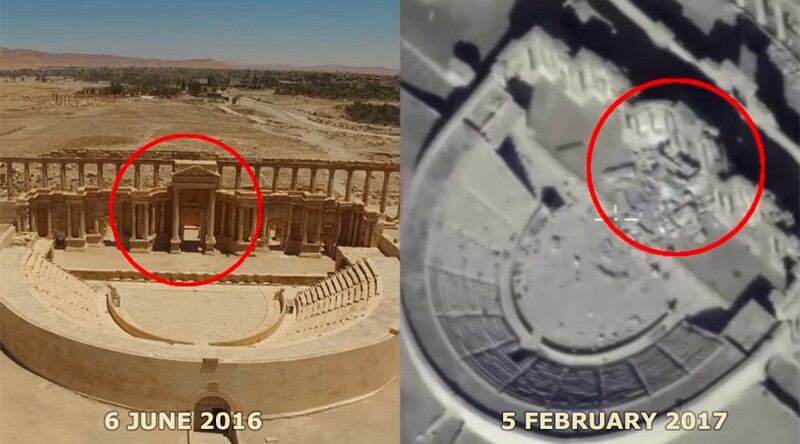 Palmyra was first captured by IS in May 2015. In March 2016, Syrian ground forces backed by the Russian Air Force liberated the ancient city, which had already lost a number of its most famous monuments. Last December, the city fell back into the hands of Islamic State. Since then, Syrian government forces have been rapidly advancing towards Palmyra with support from the Russian armed forces. According to the Russian Defense ministry, Syrian troops backed by Russian jets are currently continuing their advance, with less than 20km left to Palmyra. It also stated that over the past week Russian jets made more than 90 assault sorties. “The Syrian government forces destroyed more than 180 objects of militant infrastructure, including more than 60 checkpoint, 15 warehouses storing weapons, ammunition and military vehicles, 43 armored cars and jeeps, equipped with heavy machine guns. Casualties among terrorists amounted to more than 200 people,” the ministry stated on Monday, adding that since February 7 the Syrian army established control over a territory of 22sq km, liberating the settlements of El Kuleybe and Kirkuk. In total, since the government forces launched the operation to free Homs province from jihadists, they liberated some 805sq km of land.